This is a beautiful example of a very athletic horse who jumps in very good style. Skippy uses his legs well and has a beautiful expression. 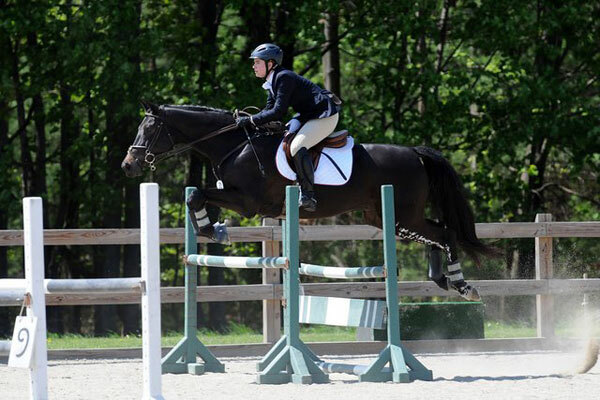 He shows plenty of scope to make this 3’6″ oxer look small and easy. Being in the middle of a combination set him up for a perfect take off as both front and rear legs are dead square. Alice’s lower leg is in excellent position but she appears to be slightly pinching with her knee. This has forced her into a “braced” position with her hips slightly behind her stirrups and her center of balance slightly behind Skippy’s. This puts her slightly behind his center of balance. You can see that she has rounded her shoulders and back slightly to try to maintain her balance and position in the air. Her hands and arms are beautiful with a soft contact release. I am slightly concerned that she may be about to snap back up on the landing side of the jump because of her braced appearance. This technique can help to balance a horse as he lands from a drop but also causes horses to get a bit low behind and risk hind rails in the show jumping portion of the event. I can see grease on his hind legs (which is used to aid horses in slipping across solid obstacles). This also leads me to believe that he may have had hind rails in the past. It is important for Alice to hold her non-interfering position on the landing side of the show jumping fence and permit him to complete his jump cleanly. They look like a solid, confident and competitive pair! Your position tells me you’re an eventer. You are somewhat defensive in this photo with your body. This was not an XC fence, but a stadium fence. If you look at photos of top level Grand Prix jumper riders, they keep their bodies more forward in the air. You need to get your upper torso more out over your horse’s neck, with your hips over the front 1/2 of your saddle. I love your attentive expression, and the soft contact you kept to your horse’s mouth in mid air. Your leg looks “dead solid” but I would like to see you get your hips more over the top of your knees…or just behind them. I don’t think you could ask any more from Skippy. His form is fabulous. Knees up, head well stretched out, and his 2 hind feet perfectly even. That indicates you hit a perfect distance for him. Yes, I read, this was part B of a triple….but that means you most likely hit a good spot at part A too. I understand your body position when riding XC Alice, but this was the stadium portion……I think if you want to make it to the top, you have to be willing and able to adjust. You can use one type of form for XC and another for stadium….and even another for dressage. You have to be flexible in your riding styles. The white on his hindleg isn’t grease but actually natural white markings. And yes, that is a natural marking, Skippy rarely takes down rails and usually it is only because we get to a super awkward spot or I let him get too flat.